A Tale of a Fool? explores the life of Guðrún Ketilsdóttir, a peasant woman born in Iceland around 1759. Guðrún worked as a farmhand for most of her adult life, and when she died she left behind a partial autobiography, which is believed to be the oldest autobiography of an Icelandic peasant woman. In this autobiography, Guðrún writes openly about her life and provides colourful depictions of the society in which she lived, providing one of the few first-hand accounts that have survived from members of the peasant class at that time. A Tale of a Fool? demonstrates how it is possible to work with this kind of source using the methods of microhistory as a historical tool to study events and individuals of the past. In doing so, it not only provides an illuminating study of the life of a peasant woman in the 18th and 19th centuries but also addresses the question of the methods, priorities and interpretations applied in the collecting, cataloguing and publication of women’s writing. 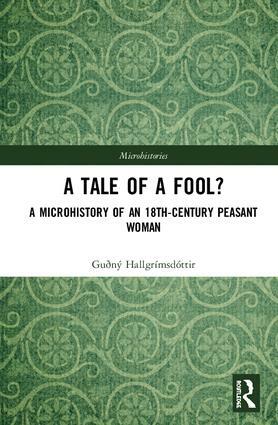 Analysing the place of the individual in traditional agrarian societies and highlighting the impact that women have had on the cultural and social history of the period, A Tale of a Fool? is ideal for researchers of microhistory and early modern Iceland/Scandinavia. Guðný Hallgrímsdóttir is an independent scholar at the Reykjavík Academy, Iceland, working on a variety of subjects concerned with women’s manuscripts. She is a former member of the board of the Icelandic Association of Historians and the Icelandic Studies Association.